Usually when you think of graffiti, you think of spray paint on the outside walls of buildings – not art on the walls of a gallery. But the creative force duo of Chicago-based artist BUNNYXLV and Simone Garcia have created a gallery that not only celebrates graffiti art – it uses it to tell a story. “Once UpON a Wall: Infinite Life” is the first of the Narrative Mural Series at Chicago’s 15th and West Gallery. 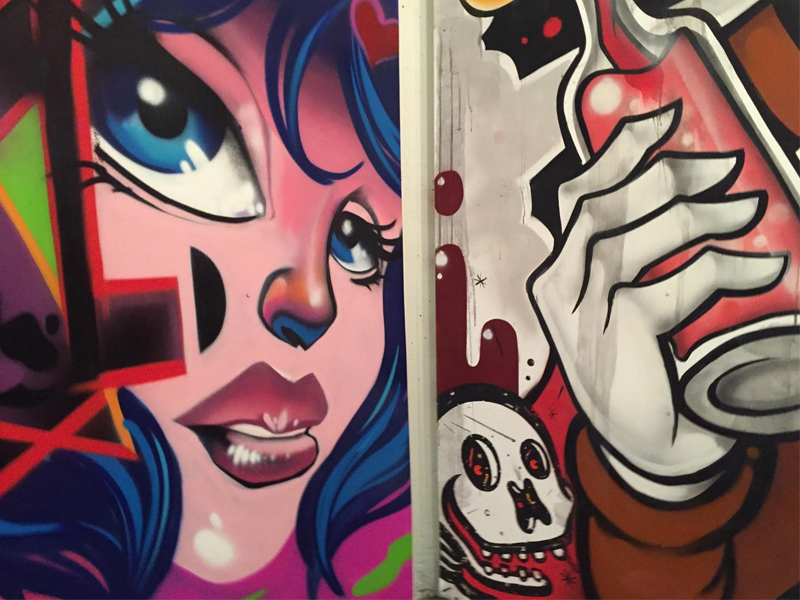 Each mural is inspired by a different vibe – anarchy, gluttony, etc., and because every wall in the gallery was done by a different artist or team of artists, every image has a uniquely different look to it. 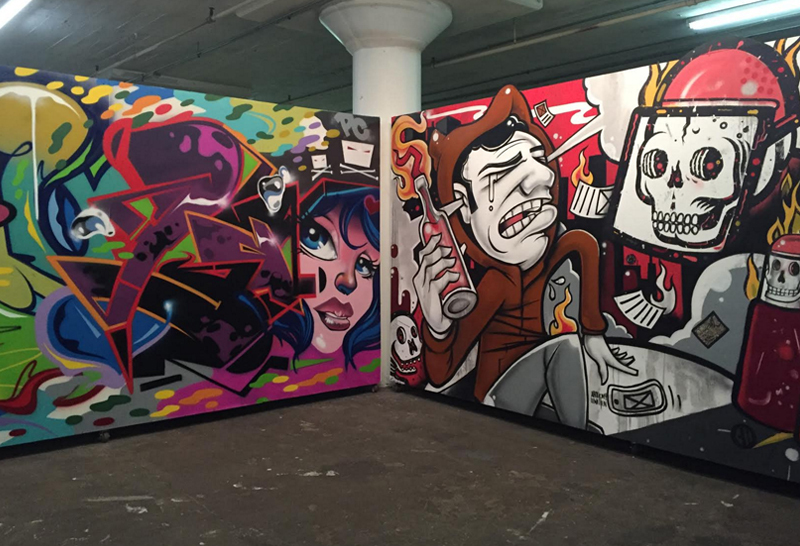 Some of Chicago’s best known street artists – Nerd, Bunny XLV, JC Rivera, Max, Brainkiller, Revise, and Katie Kapuza to name just a few – are featured in the gallery, curated by Bunny XLV himself. And while some have stuck to their iconic style, others have branched out and changed up their style for their mural. Here’s a little taste of some of the murals…but just a sampler. 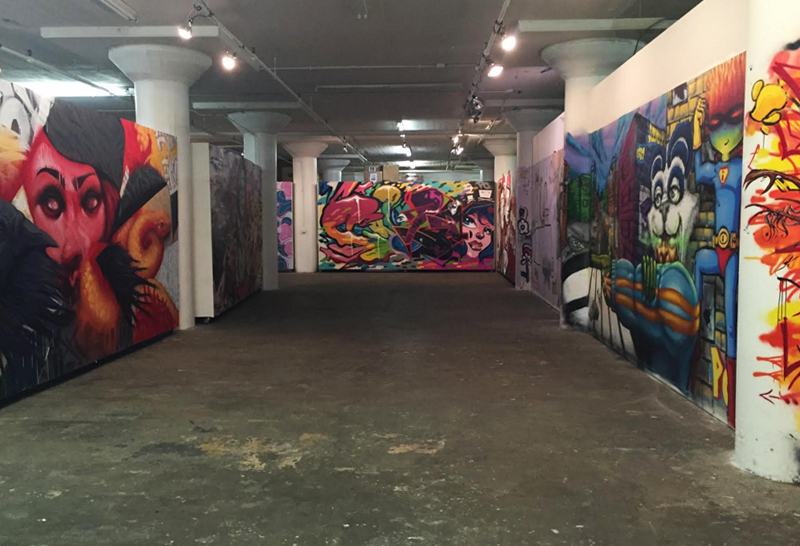 Much like most graffiti, this gallery is fleeting. All the pieces are on sale, and the gallery itself will only be here for two weeks, with two premiere nights: Friday March 4th (TONIGHT depending on when you’re reading this), and Saturday March 12th from 6 PM – 11 PM. If you’re in the Chicago area, check it out at 15th & West Gallery (2439 W 15th St.)! If you live in, I don’t know, The Netherlands, but REALLY want to see this, sure! You got two weeks, plenty of time for a vaca! And if you want to wear street art on your body, check out Brain Killer’s artist shop and Anthony Lewellen’s artist shop! Posted in News and tagged 15th and west gallery, brainkiller, bunny xlv, chicago, events, gallery, graffiti, JC rivera, once upon a wall, street art. Bookmark the permalink. If You Could Have a Pet Mythical Creature, Which Would You Pick?